Maybe it was a bit hasty when I announced in my Wednesday Yarn Along post that I would have a finished pattern for you to test knit on Sunday. I don’t have one. 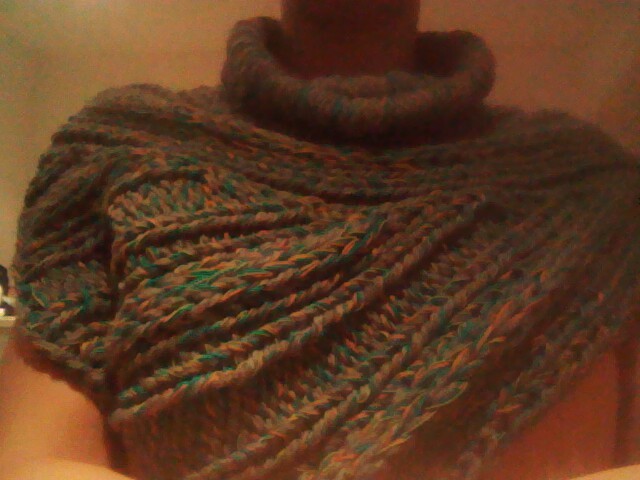 I knitted and reknitted the collar yesterday. And while I got quite a similar look to the picture of the cowl, the drape is so not how it is suppossed to be. Too stiff, standing up rather then softly falling… And because I was really annoyed by this I thought I might as well start knitting my second test version. I chose a bunch of blue and white yarns for it. With them I rechecked gauge, rechecked my notes and tried another bind off method. 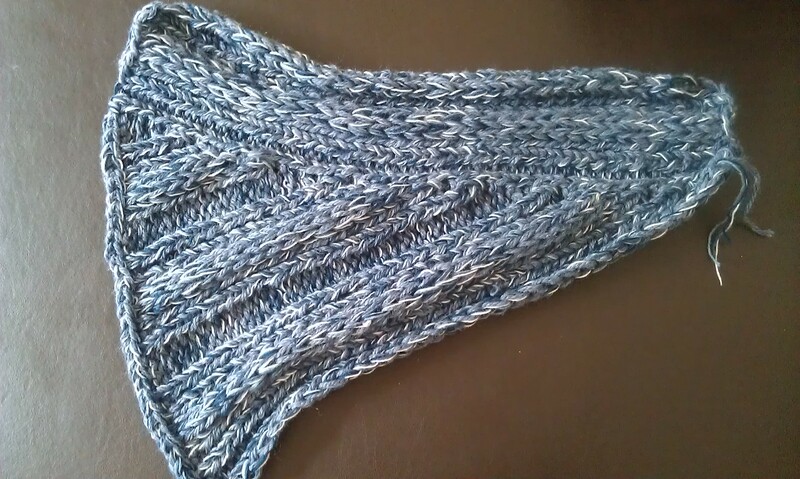 I think it looks a little neater with an icord bind off. And I could now write down the pattern for everything except the collar. But I don’t want to share that with you without knowing where the story ends. So I procrastinated the whole day. I prepared dozens of pictures for my blog and finally send my Nail Polish page live. I also prepared six more posts. And now I will retry to knit the collar. But so that you don’t leave empty handed I can start giving you information to prepare for the test knitting. To all of you test knitters out there: if you would like to test knit my pattern, send me an email to k(dot)schnorr(at)gmx(dot)de then I’ll send you the first notes to get the yarn and needles needed, to knit gauge and practice the pattern. A comment on the original post on this cowl got me thinking. I might have found a different way than crocheting around cord to get the rolls. What do you think about this look? I know this is an absolutely bad picture but the best I could make at night and without help, but I guess I did it! Better pictures and more info on Tuesday when Michael is home and can take pictures of me and my work. Update: part 4 is out too. wow! great work! I really like your take on this design. I am working on one in crochet. great idea – though I must admit I may be a little short on time. . . .
I’m sorry for so many posts… There’s a stitch in a stitch guide called Super Stitches Knitting, in the ornamental stitches section that mimics this ropey , fold over look. If anything go with crocheting over the rope. Q: how will this wash if you use rope? I try to mimic the picture of the cowl as best as possible which definitively means roping and answers your question: this thing was a prop and therefore not meant to be washable 😉 No, I think careful handwash shouldn’t do the roping any harm. It is quite well fixed in place. It’ll just take forever to dry but then to be honest I wash my cowls/sharf about only once per season so this shouldn’t be any problem. I’ll try tonight as I want to block the rest of the cowl and the roped collar is already attached. Can tell you more tomorrow. Sure 🙂 I’ll be testing some things on my second knit of the cowl this week and then I should be ready to give you all the instructions needed. Cuold you please send me an email to k.schnorr(at)gmx.de so that I can mail you all the necessary instructions. Or probably we can use cotton rope. I don’t know if you’re picking up the cowl or not, but you should probably work it flat and use short rows, then sew it to the body. I like the bigger cowl in the orignal post…try maybe a fisherman ribbing or brioche to give that look. To be honest, me too. And, I’d like to say especially on your request (no, to be honest by chance because it looked better like this, but it sounds better this way), no crocheting is involved, only knitting, sewing and a bit of weaving yarn around cords! I’d love to be a test knitter, but my email to you bounced back! You can email me at knitthreetogether@gmail.com, if you still need test knitters. Although, I will admit to having almost no crochet skills, so if there’s crochet required in the final version, it’s probably beyond me! Hey, sure you can test knit 🙂 Weird thing the email bounced… must check if I made a mistake when writing the address… And no crocheting is involved. 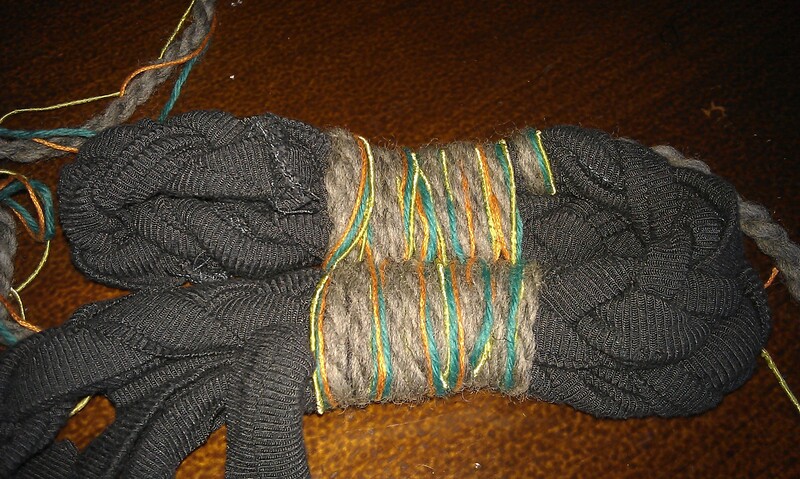 Making the collar look nice is a bit of a fiddly thing but it is pure weaving yarn in eights around two cords. From my point of view it was very easy but writing it down will be a pain. But this is where you testknitters come into play: you will need to tell me if you get what I want to say (especially in English). Sounds great! Just drop me an email, whenever you’re ready! I think I like the look of your first attempt better. This one looks….abbreviated somehow. The problem is, on its own the other one looked great. But on the cowl it was a stiff mass of yarn. This looks weird on its own but quite good on the cowl.